OK so now we get to talk about things we all secretly wonder. When we are having our menstrual cycle one of the most annoying things for me is when I need to dispose of my products. Especially when traveling or visiting someones home. We have all done it - you know when you use half the roll of toilet paper to wrap and dispose. What a pure waste when you think about it. I was sent these products for testing purposes . They are available for pads and tampons and portable packs that fit in your pocket to take with you any where you go when you need it. 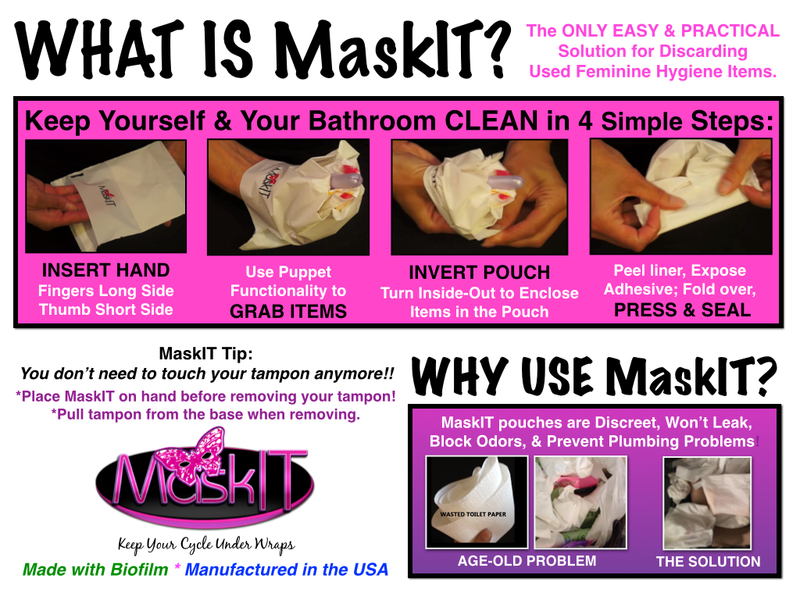 MaskIT is a specially designed patent-pending product that offers a practical & sanitary solution for the disposal of soiled feminine hygiene items. Its puppet-like function & pocket technology make it simple to grasp a used pad or tampon while protecting the hand. With a unique inversion process these items are then enclosed & sealed within a small pouch that prevents leaking and blocks smells. Disclosure: I received one or more of the products mentioned above for free using Tomoson.com Regardless, all reviews and opinions are my own. I am disclosing this in accordance with the Federal Trade Commissions 16 CFR, Part 255 Guides.